England’s Emma Hamplett won England’s first gold of the Games with victory in the javelin thanks to her throw of 49.57m. Scotland’s George Evans added Commonwealth Youth Games discus silver to his World Youths bronze with a throw of 58.19m to finish behind world youth champion Werner Jakobus Visser of South Africa with 60.94m. “It feels amazing to be Scotland’s first medallist of the Games,” said Evans. “Coming away with a silver medal, only beaten by the world champion, is the best thing that could have happened. England’s Rechmial Miller ran a 10.39 PB and Scotland’s Cameron Tindle a 10.42 PB to claim 100m silver and bronze respectively behind South Africa’s Tlotliso Leotlela who equalled the second-fastest ever time by a youth athlete with his 10.20 for gold. Also adding to Scotland’s medal haul in Samoa was Alisha Rees who clocked 11.72 in the women’s event for bronze. Ben Fisher jumped 7.38m for long jump bronze to claim Northern Ireland’s first medal of the Games. 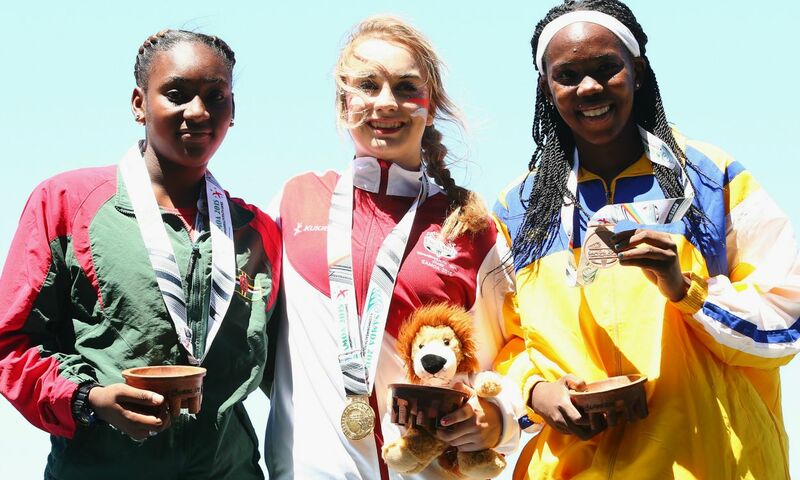 Katie Lambert set a UK under-17 hammer best, throwing 63.08m to add 57 centimetres to a mark set by Katie Head at the England Under-17 Championships recently. Jona Efoloko was also among the winners as he clocked 21.71 to take the 200m and later helped his North West team to second place in the sprint relay. Owen Richardson won the 400m in 48.73, while Canaan Solomon took the 800m in 1:53.33 ahead of Scot Cameron Steven. James Whiteaker produced a season’s best of 73.45m in the javelin to better his winning throw from the England Champs in Bedford the previous week. Phoebe Tan cleared 1.72m on her third attempt in the high jump to take the win ahead of Isabelle Cain-Daley. Scotland’s Kate Gallagher enjoyed a clear victory in the 3000m, 10:02.97, while over in the sprints Charmont Webster-Tape and Mair Edwards won the 100m and 200m events respectively. Double European T35 sprint champion Maria Lyle ran 14.50 into a -3.6 m/s wind to win the 100m and she also claimed victory in the 200m in 30.01, while T38 100m world record-holder Sophie Hahn was runner-up in both events on points. Competing as a guest, double Paralympic champion Hannah Cockroft clocked 18.86 in the 100m and 2:13.94 in the 800m. See the September 10 edition of Athletics Weekly magazine for a Stephen Green report and pictures by Harry Shakeshaft. Lynsey Sharp broke the Scottish 800m record and ran the third quickest ever time by a British woman. More in-depth online coverage can be found here. Windsor Slough Eton and Hounslow won easily by over 70 points. Tade Ojora claimed victory in the under-17 men’s hurdles in 13.72 and Ellie Rayner took the under-20 400m hurdles. Away from the hurdles, Morven Goodrum was their only other A string track winner, taking the under-17 women’s 1500m in 4:36.14. In the jumps, Sam Challis won the under-17 long jump and Dami Famakin the under-20 triple jump. Their throw successes included Amy Holder in the under-20 discus, Jake Norris in the under-20 hammer and Bayley Campbell in the under-17 hammer. The day’s best performance award went to Sale’s European junior champion Adam Hague who won the pole vault with a clearance of 5.20m. Birchfield’s Kyle de Escofet won an under-20 sprint double in 10.73/21.61 while Kaie Chambers-Brown did likewise in the under-17 event in PBs of 10.88 and 21.29. Rugby’s Adam Wright gained a under-20 men’s 800m and 1500m double in 1:54.51 and 3:59.51 while Blackheath’s Niamh Bridson-Hubbard did likewise in the girls events. Further details and David Griffiths’ photographs will appear in this week’s magazine. Edinburgh narrowly won the under-15 event from Blackheath and Bromley. Sale Harriers were third. Edinburgh won through consistent scoring and track winners included U13 800m runner Niamh Edgar, 70m hurdler Ellie O’Hara and the U13 girls 4x100m relay team. On the field, they gained a high jump triple success through U15 Dean Anderson (1.80m), U13 Owen Ashell (1.56m) and Edgar (1.45m). Lily McQueenie won the U13 shot with a PB 8.33. Daniel Afolabi of Sale gained a sprint double in 11.35 and 23.08. Blackheath’s Henry-James Cowie won the 800m in 2:05.3 and team-mate Angus Harrington won the 1500m in a PB 4:18.93 from National 3000m champion Zak Mahamed. Harrington also won the javelin with a PB 44.92m throw. Another Blackheath winner was England under-15 hammer champion James Lancaster, who easily won his speciality with a throw of 54.62m Rowan Fuss won the under-13 1500m by 19 seconds. Cardiff’s Brett Morse’s brother Jay won the under-15 discus with 36.74m and the B shot with 13.20m. Further details and David Griffiths’ photographs will appear in this week’s issue. Dan Cliffe won in a PB 29:46.75 while Laura Whittle’s 34:02.89 was the quickest women’s time. Kevin Fahey’s report will appear in this week’s AW magazine. Lucy Hatton was second in the 100m hurdles in 13.09. Desiree Henry was fourth in the 100m in 11.33, a race won by Dafne Schippers in 11.12. Guy Learmonth was fifth in the 600m in 76.70. Tom Lancashire was second in the 3000m in a PB 7:49.35. World silver medallist Shara Proctor won the long jump with a leap of 6.62m. Rabah Yousif was second in the 400m with a time of 45.59. John Beattie won in a fast PB of 29:12 with Dewi Griffiths second in 29:18. World masters 10,000m champion Kojo Kyereme was third in 29:51. It was a close women’s race with Rachel Felton’s 33:27 narrowly beating Michelle Ross-Cope’s 33:35 and Olympic 10,000m runner Kate Reed’s 33:36. Chris Thompson continued his return towards top form after injury by winning the Kew Gardens 10km in 28:58. Steph Twell was top woman with 33:40. Peres Jepchirchir ran a world-leading 10km with 30:55 to also break the course record. Daniel Chebii completed a Kenyan double, winning the men’s race in 27:42. Ethiopia’s Genet Yalew won in 30:58 ahead of Shalane Flanagan who clocked 31:03 to break the American 10km record of 31:06 set by Lynn Jennings in 1990. Britain’s Jessica Coulson ran a PB of 32:44 in sixth, dipping under 33 minutes for the distance on the road for the first time. Bernard Koech of Kenya won the men’s 10 mile event in 45:21, while British athletes Scott Overall and Matt Hynes were 10th and 13th, clocking respective times of 47:55 and 48:14.